Tips and Tricks for designing your Memorial Decals. 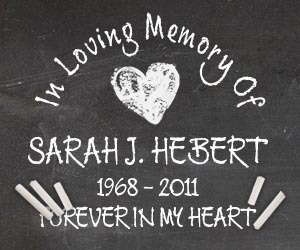 We offer many different sizes of Memorial Decals for you to choose from. It's important that you choose the correct size for the application you have in mind. 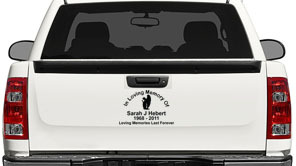 Most In Memory Decals are placed in the back window of your car or truck. The smaller 6 inch wide and 9 inch wide decals look best in the corner of your window as shown in these examples. Below is a 6 inch wide memorial decal in the bottom corner of the window. Here is a 9 inch wide decal in the same corner. The larger sizes we offer, including 12 inch, 15 inch, 18 inch, and 21 inch wide options, look best when centered in the back glass. 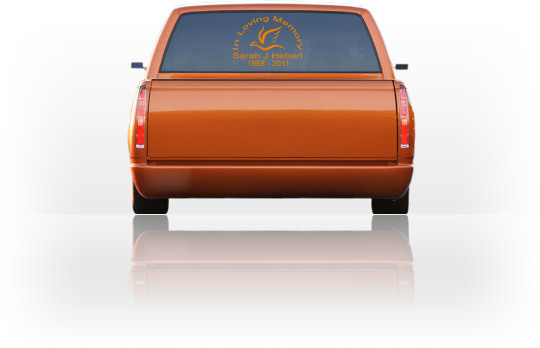 This is an example of a 12 inch wide orange In Memory Decal. Our most popular larger size, 15 inch wide, centered in the back window. At 18 inches wide, the decal takes up most of the space in the middle of the window. And the largest size is 21 inches wide, as shown here. Decals larger than 21 inches wide tend to be too tall for most vehicles. When choosing the color of your Memorial Decal it's important to consider the visibility and how well it can be seen from afar. Generally, the brighter the color, the easier it will be to see. White is the most popular color we sell because it's the easiest to see when installed in a window. Black does not stand out well in a rear window. Compare black and white in the image above. Most colors are clearly visible on glass except for black, brown and dark green. White stands out the best, as well as the other bright colors, the fluorescents and the metallics. Black and other dark colors work well against light backgrounds such as this white tailgate shown above. 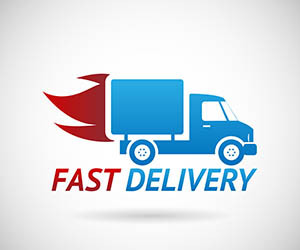 Because your decal will be sized to the width of your choice, 6, 9, 12, 15, 18, or 21 inches, we recommend abbreviating the dates if you put more of the date than just the year. For instance, if you choose a 6 inch wide decal, we will make the text 6 inches wide to fit your requirements. That's not a problem if your line of text says "1935 - 2011". But if it says "October 30th, 1935 through January 21st, 2011" it can be difficult to fit in a 6 or 9 inch wide decal. If you try to fit that many letters in a 6 inch space, the letters will be tiny. This can make it harder for you to install your decal, and with tiny little letters, they might fall off your car prematurly. For 6 or 9 inch wide decals we recommend sticking with just the years "1935 - 2011", or at least using a numbered date system "10/30/1935 - 1/21/2011". The longer dates are fine with 12-21 inch wide decals. Your lettering won't be too small. Balance really only comes into play if you design a "Basic with Image" or "Basic with Image Plus" decal. With these two styles you can put a date on the left and right of the image that is centered in the middle of the decal. This is a popular style and generally looks very nice. But sometimes we receive designs that are not balanced well and will not look pleasing when installed. For instance, if you put "You are my best friend" on the left side and "John" on the right, you design will look off. Of course, we will create your decal however you like. But we strongly recommend sticking with dates on the left and right side for a better aesthetic. It is important to take your time and prepare when installing your Memorial Auto Decal. Taking your time and following these simple steps will help ensure that you don't accidentally ruin your new decal. Installation is done on the outside of the window unless you requested to have your decals produced backwards for inside installation. First, you need to decide where you want to install your decal. Most decals are mounted in the rear window. If you have a dark color such as black you will probably want to install your decal somewhere else such as a tailgate because the dark colors don't show well in a window. Larger decals are usually centered in the rear window. Smaller decals look best in one of the corners. See Choosing Your Decal Size for more information about where to install your decal. Next you need to clean your window and remove any dirt or debris from the spot you are installing your decal. If you install your decal on a dirty window it will not last very long. The next step is to peel the back of the decal. We recommend only peeling the top 1/4 inch of the back and fold it over. Then you can freely move the decal around the window to find the position you like. Make sure the memorial decal is straight, then carefully apply the top 1/4 inch of sticky tape that you revealed earlier to the window. It is important that you do not wrinkle the tape as you apply it to the window. Once the top portion is applied correctly you can begin to peel the rest of the back off by pulling it down, away from the decal. As you remove the backing the decal will apply itself to the window. Once again, go slow so you don't wrinkle the decal. Use a pencil or ruler to help apply the decal evenly to the window. After the back is removed and the decal is applied to the window, trace the decal with your finger to help make sure it is stuck to the window. Try to avoid sticking the tape to the window any more than you have to. Finally, remove the application tape by pulling it off steadily and slowly. If part of the decal tries to stay with the application tape just back up a bit and stick that part of the decal to the window again with your finger. After the tape is off your decal is done! If you did it right you should have little to no bubbles behind the decal. If you have any bubbles just push them out with your finger. Difficult bubbles can be removed easily by poking an invisibly small hole with a pin or needle in the needle so the air can escape. Push the bubble out with your finger and you are done!